So we were in Kentucky for two weeks. Carrie's uncle has cancer. It is bad. We wanted to spend as much time with him as we could. Luckily her job allows remote work by default. I had to get my two weeks approved from my employer but they did allow it. We worked the whole time while still having time to visit. I am glad to have that luxury. I am glad to have so many things. I found myself longing to blog. Am I weird? Is this so much a part of me that I MUST do it? I guess it is digital therapy. Who knows. We used to live in Houston. I have never been to West, TX. I have been on the western side of Texas. My heart goes out to this town that is still dealing with this major explosion. It is a terrible thing that happened and we, as a country, need to care MORE for these people and this situation than any of the terrorist news and happenings. If you want to show you are an American, donate your time and efforts to helping this town heal. I have to weigh in on the Boston Marathon situation. Several friends of ours were in Boston and one friend was REALLY close to the carnage. This act of cowardice is absurd. To me it matters not the religion, race, socioeconomic status, or color of these assholes. 1) That we no longer respond to this type of situation with jubilation in the streets when the perpetrators are captured. This over-celebratory reaction illustrates why these radicals try and damage our country. We've fought off much larger enemies ... let's act like we've been there before. 2) That we help these people that are injured. As an endurance junky ... my heart and soul goes out to any of the injured that are runners. I cannot imagine. 3) That our country becomes a single well-oiled machine without a hint of any division. We are seen as a weakened entity the world over due to our political polarization. Until we fix this we are destined to suffer attacks like these and WORSE. 4) That we not play the "if" and "I woulda" game. No one was going to prevent this attack. Sure, the FBI interviewed this person but one of the reasons we love this country is the freedoms that our constitution allows. These people are clever. There wasn't enough evidence to detain him. Looking back and pointing fingers only insults the bombing victims. Stop it. This whole situation is awful. I despise people that allow themselves to hurt others in the name of some ideology that has ZERO validity in the real human world. Yeah, I had two 30-mile running weeks while we were in Kentucky. I dealt with some hotspots on a few runs and then I figured out that my shoes were causing the problem. I originally thought it was the insoles. I switched to my NB trail runners and my feet recovered after two runs. I ran a 1:45 13.2 while I was in Kentucky. I controlled the run. It was a confidence builder. I wish I'd had time to run the full 26.2 that day. I think I could have maintained the same pace through the whole marathon. Someday soon I will get a chance to see what I can do in the full 26.2 WITHOUT swimming 2.4 and biking 112 first. Running is my favorite but now that we are back in town I get to ride and swim again. I actually started missing swimming last week. I never ever thought I would type that. I left for a trail run around 6am on Sunday morning. The goal was a 2 hour run with as much incline as I could handle. Right out of the driveway I knew I should have stayed in the bed. I ocassionally have one of these adventures but Sunday tops them all. It was a true test of my mental fortitude. It was one of those days that the old Bryan would have called for a rescue chopper. Keep reading. The run to get to the trail system is about a half a mile and goes up about 150 feet, so it's not flat but not a giant incline either. It's enough to get your attention. I have run up this hill about 30 times since September of 2012. I started feeling a little better as I got out on to the trail and proceeded to set a couple of PRs on some segments of the trail. "Okay, now we are ready to rock", I said aloud because no one was around. I stopped of at the bathroom at Dreamy Draw and forgot to restart my Garmin. I was mad. That irritates me when I do that. I should just let it run. I think I will from now on. I ran up a nice steep section of trail that was short. Maybe a quarter mile. That felt good. I wanted to get more elevation. I headed up a new section of trail that I haven't used yet. Then, I found a little used off-shoot that had some fresh footprints on it. It looked long and steep. I was all in. Well. That was the beginning of the adventure. Yes, there were footprints which in my mind makes it a trail. Carrie pointed this out to me. "So because two other idiots like you have gone up this ravine, then it qualifies as a trail?" I love my wife. She makes me laugh. She's right. This isn't a trail. It's a drainage with some footprints. 8 tenths of a mile and 1200 feet of elevation later I stood atop a knife edge. The "way down" was just as steep as the way up. I carefully slogged my way through cactus, brittlebush and scree while keeping tabs on those infamous footprints. Then the pain sat in. My stomach swelled and felt like it was about to explode. I hid off to the side of the trail and let it go. I still don't know why I hid. I was not on a trail and no one was around. Two more episodes like that happened before I could get back to the house. That was the longest 7 miles of my life. Walking hurt, jogging hurt, all out running was not an option. Suffer fest for sure. 1) If you cross train by digging holes and building things outside in the desert for 9 hours ... don't go out the next morning on a huge trail run and expect to be fresh. 2) Just do hill repeats on trails that have been used. Don't try and be a hero and get hurt or killed doing something ignorant. I ran a mile the following day and felt fine even though eating was still not too appealing. On Tuesday at lunch I had one of the coolest workouts I've had in a while. 6.6 miles and 320 floors on the StairMaster in one hour. I guess I'm going to be okay. A cause is a cause and somebody out there spends a ton of time on a cause that garners any attention. This cause appeals to me. GardenPool.org. Carrie and I have spent 18 hours of the past two Saturdays volunteering at Garden Pool builds. We've worked side-by-side with Dennis and his wife Danielle. These two are WORKERS. They are also TEACHERS. Now that I care about what I consume in my diet - the potential of growing my own food is something for me to persue. My odomoter rolled over to 10,000 miles yesterday afternoon! That's right - I have biked, run or swam 10,000 miles in the last 18 months. I started officially tracking my daily output on September 1, 2011. 10,000 miles has taken me 1100 hours. That is about a 9 mile per hour average. I have burned approximately 180 pounds of tissue during that time. My thought here is this ... would I weigh 370 if I had just eaten and not moved? I've done 1093 workouts for an average of 9.14 miles per workout. My shortest 'workout' is probably a 300m swim ... and the longest was the 15 hours at Ironman St. George in 2012. I have traveled 0.4 times around the globe. Almost half way around the planet. I have generated enough energy to power 14,783 televisions. I have saved 528 gallons of gas. I should really ride to work more often to see this into a reality rather than just a stat. Last but not least ... I have burned a whopping 3,408 donuts. Perhaps I should have been eating more donuts along the way. All of this while maintaining a full-time job and two part-time jobs. Idle hands I suppose. I have set up my life such that I do have it easier than some. No complaints there. Rest assured this lifestyle is not without planning and effort. It exists by design - not luck. Statistics are great. All numbers, racing and timing aside ... I am forever changed for the good. While I still grumble a bit about certain things I am nowhere near as "doom and gloom" as I once was. Besides, my blood pressure, cholesterol, body fat and blood sugar are all 100%+ normal. Those are the real numbers that matter AND that will really matter in 2073 when I will reflect back on all this madness and smile. April 2013 -- three months in review. 2013 has been a pretty cool year so far. I am definitely not as training obsessed as I was a year ago right now. That said, I am probably more equipped, both physically and mentally, to handle Ironman today. Part of that is because I have now been there. Experience does matter in endurance sports. The other part is that I am figuring out how to temper my ambitious training schedule with more intense and less frequent work ... which gives me time to rest between efforts. I've been focused on trail running and hiking for 2013. I've already gained over 50,000 feet of vertical on my training runs in 2013. I have run a little over 400 miles this year. 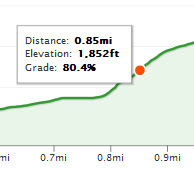 This math tells me that my average mile has 125 feet of elevation gain. This is about a 6% grade on average ... and well above any run training I did in 2012. These are intense runs ranging from 5 to 13 miles depending on the amount of time I have to complete them. For my genetics, run fitness is unparalleled when it comes to cardiovascular training. As I run with more strength my bike and swim output rises. At the end of the year last year I was focused more on cycling and my run suffered. More remarkable to me than anything is my durability. Sure I get sore. Sure I have inflexible hips. These are par for the course. The only real issue that I can say that "nags" me are my feet. I switched from a heel striker to a toe striker. This happened in my attempt to be a mid-foot striker. I battle with sesamoiditis from time-to-time. Yes, I have tried many types of insoles. Yes, I have tried many types of shoes. I'm working on it. In January and February we walked. It was like the Lord of the Rings Trilogy. We walked for hours and hours. This was by design. We were preparing for the 6-day Grand Canyon adventure. It was a tremendous success. Roughly 70 miles in 6 days ... most of which were with a 30 pound pack. I did race the Desert Classic Duathlon on March 3rd and did pretty well. I didn't scorch the second of the two runs like I had planned, but my first run and bike were solid. We've also worked on the house quite a bit during the cooler days. As summer approaches - it is time to move life more indoors. I feel relaxed and comfortable with myself for the first time in perhaps my entire life.